Erzsébet Czakó is Professor of the Institute of Business Economics of the Corvinus University of Budapest (CUB). She is co-director of the Competitiveness Research Center (CRC), which coordinates competitiveness surveys and research projects in Hungary since 1995. 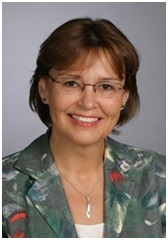 She has been elected member of the Committee of Business Economics of Hungarian Academy of Sciences since 2002. She holds MA in Economics and Sociology (then called Karl Marx University of Economics), 1986, a Ph.D. in Business and Management, 2002, and a Dr. Habilitation degree, 2011, all from CUB, Budapest, Hungary. Her research fields of interest are contents of and approaches to competitiveness researches and programs, and competitiveness of industries and enterprises. She is editor and author of two books on the results of CRC, one of them in English. Her recently adopted research and teaching field is International Business (IB). She is editor and author of the 1st Hungarian language textbook on IB, which was published in 2010. Her research focus is on theories in IB and international strategies of late comer and emerging country multinationals. Since her graduation she has been working at the CUB in different positions, and from 2005 she is the director of Institute of Business Economics. She was visiting scholar at Catholic University of Leuven (Belgium), and participated in special programs at Harvard Business School, Kelley School of Business (USA), London Business School (GB) and HEC (Jouy-en-Josas, France). She is proud of coaching teams participating in international case competitions: the winning team of the 14th International Case Competition at Ivey Business School, Canada, in 2002; winning team in the 2nd International Case Competition at the Copenhagen Business School, Denmark, in 2003; and the 2nd placed team of the Marshall Case Competition, Los Angeles, in 2005.